Location in Rockland County and the state of New York. 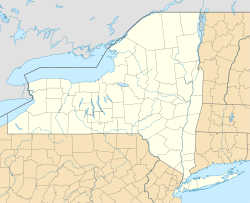 Chestnut Ridge is a village in the town of Ramapo, Rockland County, New York, United States, located north of the state of New Jersey, east of Monsey, south of Spring Valley, and west of Nanuet. The population was 7,916 at the 2010 census. Chestnut Ridge was incorporated in 1986. Prior to 1986, Chestnut Ridge was an unincorporated area within the town of Ramapo often referred to as "South Spring Valley" (its fire district), as many postal addresses carried the Spring Valley designation. According to the United States Census Bureau, the village has a total area of 4.9 square miles (13 km2), all of it land. As of the census of 2000, there were 7,829 people, 2,551 households, and 2,107 families residing in the village. The population density was 1,584.6 people per square mile (611.9/km²). There were 2,601 housing units at an average density of 526.4 per square mile (203.3/km²). The racial makeup of the village was 73.96% White, 13.87% African American, 0.13% Native American, 6.74% Asian, 0.06% Pacific Islander, 2.68% from other races, and 2.55% from two or more races. Hispanic or Latino of any race were 8.09% of the population. The village has seen an influx of ultra-Orthodox Jews in recent years. There were 2,551 households out of which 32.3% had children under the age of 18 living with them, 72.2% were married couples living together, 7.3% had a female householder with no husband present, and 17.4% were non-families. 13.6% of all households were made up of individuals and 6.6% had someone living alone who was 65 years of age or older. The average household size was 2.87 and the average family size was 3.12. In the village, the population was spread out with 22.7% under the age of 18, 5.8% from 18 to 24, 27.0% from 25 to 44, 29.1% from 45 to 64, and 15.4% who were 65 years of age or older. The median age was 42 years. For every 100 females, there were 94.8 males. For every 100 females age 18 and over, there were 89.2 males. The median income for a household in the village was $86,468, and the median income for a family was $95,551. Males had a median income of $57,420 versus $43,548 for females. The per capita income for the village was $33,227. About 0.9% of families and 3.5% of the population were below the poverty line, including 0.3% of those under age 18 and 5.0% of those age 65 or over. Duryea Farm of the Fellowship Community - 101 Ackertown Road. The farm was founded in 1883. Beginning in 1960, the Duryeas invited the public to the harvest. The farm is now owned and operated by the Rudolf Steiner Fellowship Foundation, which converted the orchards and gardens to produce biodynamic organic fruits and vegetables. Little Red Schoolhouse Museum - 50 Schoolhouse Road, east of Route 45. Once a one-room schoolhouse, it is now a museum owned and operated by the east Ramapo Central School District. It was built in 1890 and used until the early 1970s when pre-kindergarten classes were held there. Children's Park, located in east Chestnut Ridge. This park contains tennis courts, basketball courts, a play ground with swings, a junior sized baseball field as well as a paths through the woods and open fields for pets. Christian Community Church, 15 Margetts Rd. Congregation Shaarey Tfiloh, 972 Chestnut Ridge Rd. Coptic Orthodox Church, Rose Hall at Green Meadow Waldorf School, 307 Hungry Hollow Rd. Faith Assembly of God, 921 Chestnut Ridge Rd. Mosque of the Jerrahi Order. 884 Chestnut Ridge Rd. Congregation Torah Utfilla, 750 Chestnut Ridge Road. ^ "Profile of General Population and Housing Characteristics: 2010 Demographic Profile Data (DP-1): Chestnut Ridge village, New York". U.S. Census Bureau, American Factfinder. Archived from the original on September 11, 2013. Retrieved February 2, 2012. This page was last edited on 13 November 2018, at 02:22 (UTC).